← What’s the fuss about Thunderbolt ? 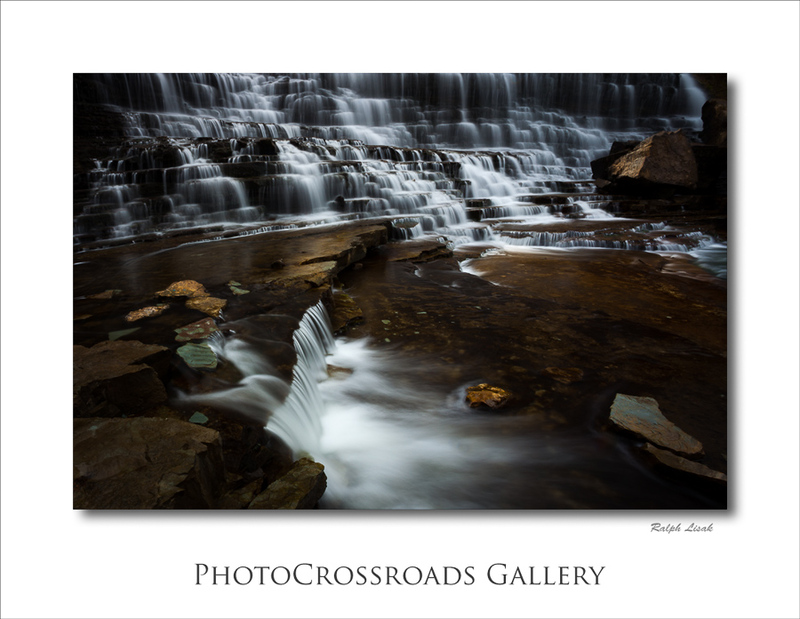 The image that you see above was shot at Albion Falls in Hamilton, Ont. One of the fellow photographers, who happen to like it, was planning to visit this place and asked me about the best time of the day for a visit. I thought that this could be a nice pretext to look at the planning process before you arrive at the location. I check the sunrise/sunset times along with the of rise/set azimuth lines. 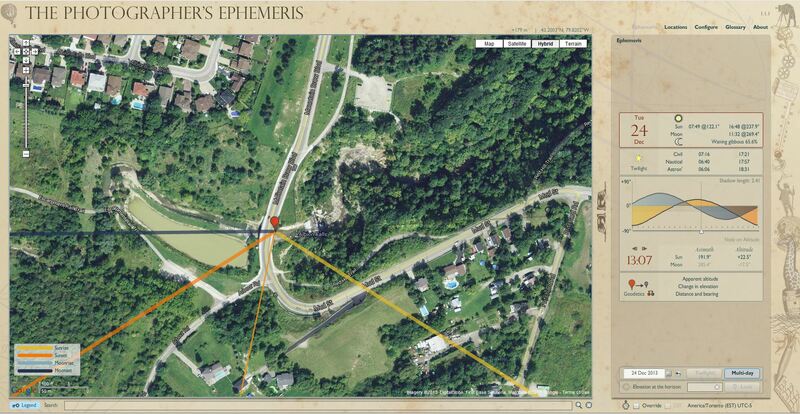 I like to use a simple yet very useful program “The Photographer’s Ephemeris”. Actually, let me re-phrase it. This program is not just “useful”, it is brilliant !!! It is free for the desktop version and $8.99 for iOS/Android and it can be downloaded from the developer’s site here. They also have a very useful tutorials and blog that I visit occasionally. I look at the detailed location map, typically using Google Maps to understand the terrain topography. I check the local weather forecast for a few days before planned visit. There are a lot of web sites providing that but in my experience it is not a bad idea to check a few of them and compare forecasts. I also like to look at radar and IR images if available for the area. Before taking off, I often do a last minute check to make sure that everything at the location is as planned. Finally, I do some research on the web to view images of the location. Most of them are rather bad (to say the least) in a photographic sense but they give me an idea of the potential angles that I can use to show the place. Now back to the original question, what is the best time of the day to photograph Albion Falls ? As usual the answer is: it depends. Clever, eh ? It depends on how you want to capture the falls. Are you planning to show the rock structure and water cascading over it (like in the image at the top) ? If that’s the case then you will be best served by scattered, soft light of the overcast day. Or you could photograph there early in the morning or in the afternoon when the falls are in the shade. The way they are positioned (facing East) with a big portion of the falls being deep in the ravine, I think, it is pretty much impossible to have a nice side lighting for the entire falls structure. The falls will be side-lit around noon but the sun will be almost vertical (actually, at 70 degrees according to The Photographer’s Ephemeris) with very harsh, difficult light. 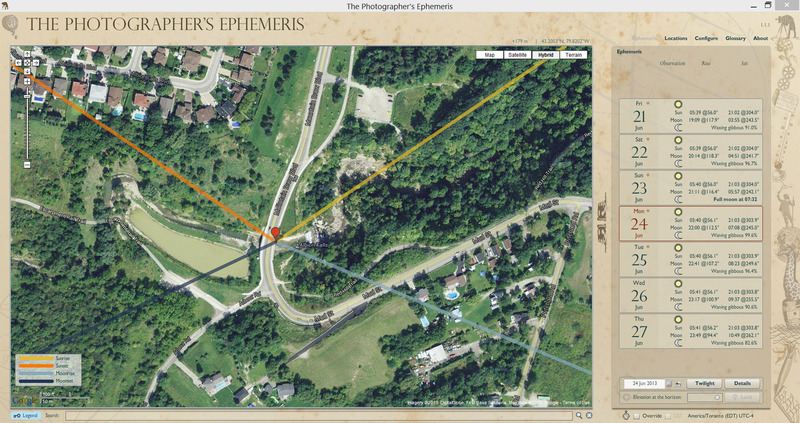 While you look at the screen capture from the Photographer’s Ephemeris at Albion Falls (click to see larger) for June 24, you can see that from sunrise till approximately noon, the falls will be mostly front-lit. Then, after 1pm, the sun will be actually behind the falls, which means that they will be in the shade. For comparison, I included a screen capture from TPE for December 24. As you can see the rise and set lines are entirely different. Also, it is good to know that at 1pm the sun will be only 20 degrees over the horizon, which would give you a much better chance for attractive side lighting. Now, it will be a different story if you want to show the entire falls including the surroundings (which by the way, are not that attractive so some clever framing and/or Photoshop post-processing may be recommended). The best strategy would be to photograph at sunset although it will be probably quite challenging to find an angle to show both: the falls and the sky in some logical manner. This time of the year sun will be disappearing below the horizon almost exactly behind the falls so with some luck, you can capture a very nice, colorful sky over the falls. Expect that handling a very large dynamic range will be the order of the day. The usual approaches will apply: a) use of a neutral, graduated filter; b) capturing two frames, one exposed for the shade and one for the sky and combine them in Photoshop; c) HDR (ONLY if you can do it tastefully – in Canada you can get charged for heavy-handed use of HDR ……. Just kidding. Unfortunately, we do not have such laws). This entry was posted in Locations, Software Tools and tagged The Photographer's Ephemeris. Bookmark the permalink.